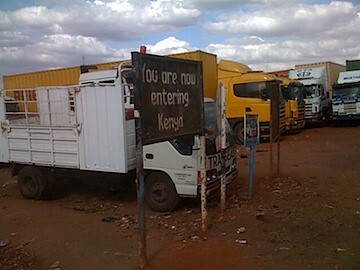 Crossing into Kenya from Uganda, at Busia, was the usual mayhem. Goods trucks were parked in long rows down the main street waiting for their paperwork to clear. 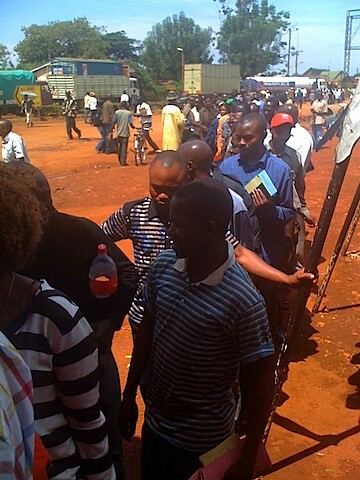 Young guys run up to the car to offer their services as middle men to handle our customs and visas for a fee. We learnt very early on, at Kazangula in Zambia, where the signs at immigration insist that no brokers are allowed to deal with the officials, that we didn't need or want someone helping us. As it turns out, at every single border crossing there is a very simple process: get the visa, sort out the car through customs, pay any taxes or fees, done - move on to immigration on the other side and repeat with other taxes to pay and other forms to fill in. That sounds easy, but of course is attended by uncertainty and chaos. Still, we wouldn't trust someone with our passports, our dollars, our car papers. Instead we found a place to park in the midst of trucks, soldiers, vendors selling cold drinks and snacks and officious looking men, and wandered off to find immigration to get our exit papers. One thing that has been singularly lacking at the borders has been decent signage. There are any number of huts and containers serving as offices, forex shacks and barracks, but nowhere a clear sign who does what and where to go next. The best option for us in the beginning was to follow the overlanders in front of us and hope they knew what they are doing. Eventually we worked out to look for the distribution point of immigration forms, although those are sometimes just photocopied sheets, so that is not so easy either. 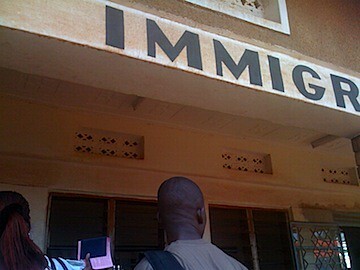 Once we have located immigration, we fill in forms that are never looked at again by another human being - first name, last name, passport details (which I know by heart by now), length of stay, mode of transport, contact details. Then we get scrutinised to make sure we match our passport photo and sometimes have to fill in a big ledger, too, and that's usually it. We haven't overstayed our visa anywhere yet, so I don't know what would happen in that case. I suspect a small dollar amount would take care of it. After immigration, customs. Stuart usually does that part. It means getting the carnet stamped to leave the country, and sometimes the payment of exit taxes. When we left Kenya, we had spent two days over our seven day transit limit and had to pay US$40 for road tax. No big deal as we hadn't spent anything coming into Kenya. Getting the car out of a country is usually also a pretty easy affair. No-one has so far even wanted to look at the car in case we were smuggling something, or even checked our insurance. Before we started I thought that the border crossings would be day-long events, where our car gets taken apart Cold War style, our intentions are scrutinised and we might be sent back for lack of the right paperwork. As it turns out we are through much faster than the backpackers travelling by matatu or the overland trucks with their crowds of youths. May it stay like this for the rest of the journey.